Adding such tools was an invasive procedure that involved hacking into the wooden binding or cutting holes in pages. In spite of this, they were quite popular in the later Middle Ages, especially during the 15th century. This shows that they served a real purpose, adding value to the book’s contents: some clarified the text’s meaning, while others functioned as a calculator or, astonishingly, allowed the reader to tell time. These fascinating add-ons – which are really not that different from the apps on our smartphones – turned a static handwritten book into an interactive object. A volvelle is an instrument that consists of one or more rotating disks mounted on the page. 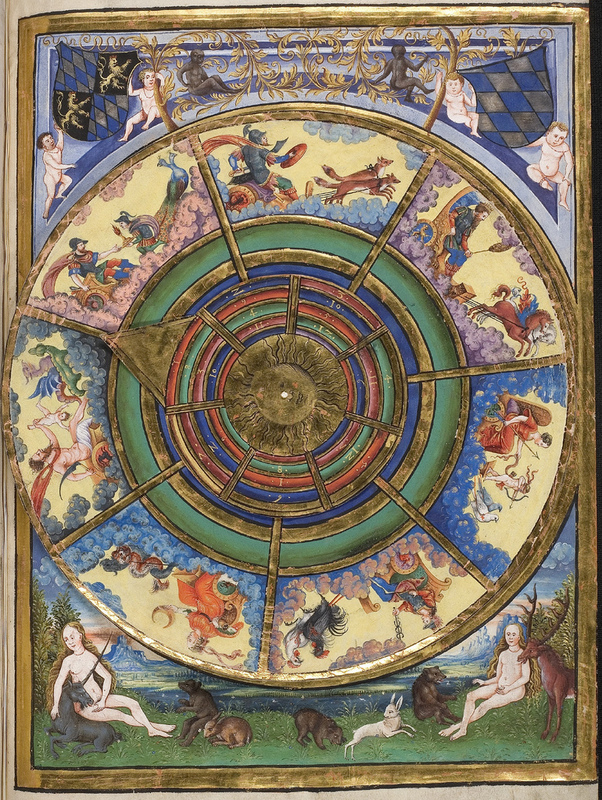 Volvelles allowed the reader to make a variety of complex calculations, such as the position of the sun and the moon, or the precise date of Easter – which was, like the volvelle, a moving feast. The one seen in Fig. 1 contains no less than three revolving disks, which are pinned to the page in a central point: two show the cycle of sun and moon (note the charming depictions at their pointers), while a third presents the Zodiac. In spite of its simplicity, the device provides a surprising wealth of data, which could be read if one knew how to interpret the dials. 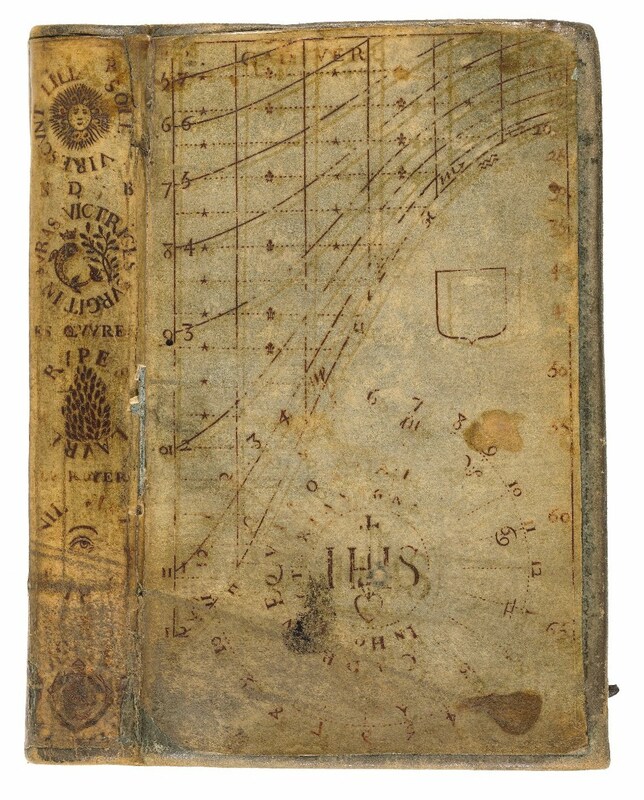 However, volvelles were not always crude instruments providing dry data. Some are actually a pleasure to look at (Fig. 2). Others added an entertaining touch to the moving parts. The one in Fig. 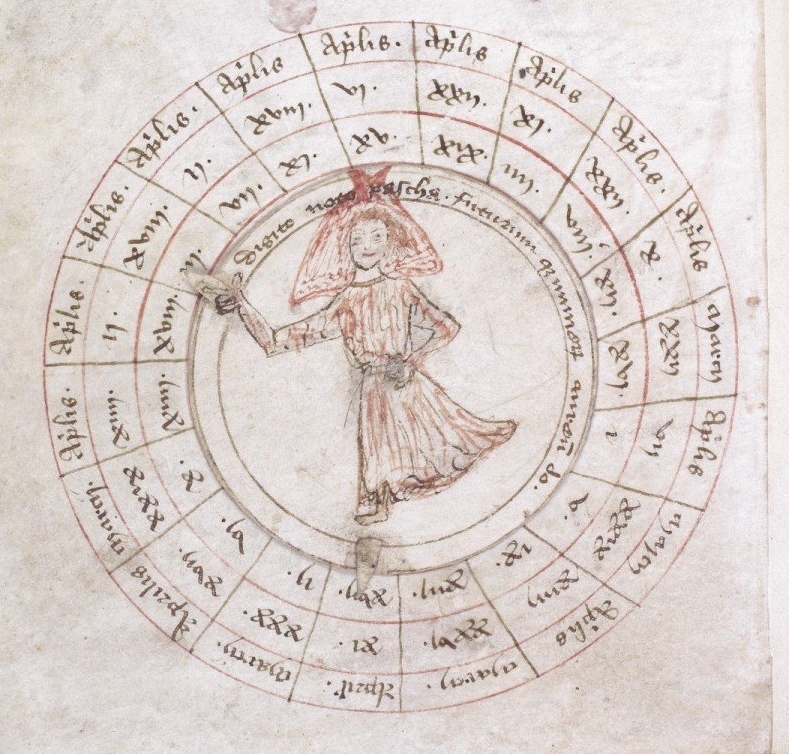 3, for example, calculates the date of Easter, a popular application of the volvelle, but in this case the answer is pointed out by a spinning lady. 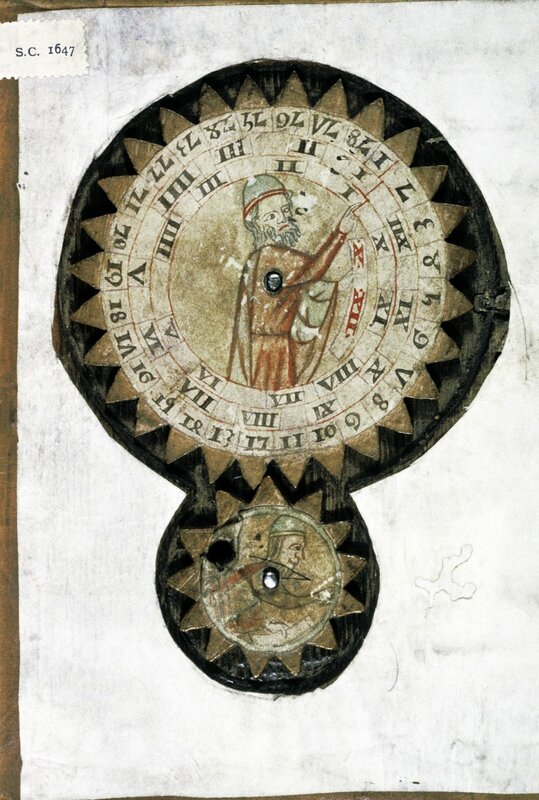 The oldest volvelles are connected to the scientific explorations of Raymond Lull, a thirteenth-century scholar, who introduced the clever device from Arabic scholarly culture. 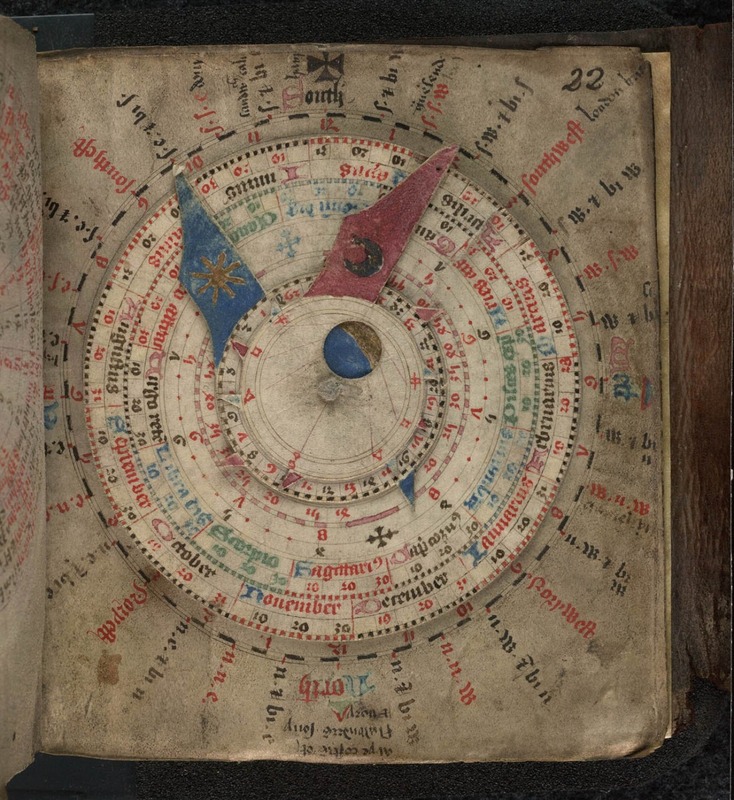 It explains why the earliest volvelles date from the 13th century (there are no older manuscripts that hold them, as far as I am aware), but also why the oldest ones are found in books holding works by Raymond Lull. These oldest specimens are less sophisticated: they have a limited number of disks and present less data on and around the dials (see a Lull specimen from the early 14th century here). Such crude medieval computers could make a page very bulky. It is surprising, however, how much volume a volvelle could take up without compromising how well the book could be handled.The one I encountered in an archive some time ago even makes use of pieces of wood, giving it the appearance of a real instrument, but also adding a certain clunkiness (Fig. 4). 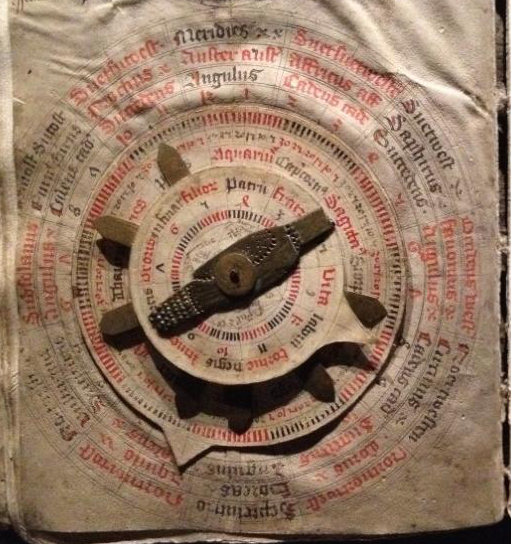 Volvelles are not the only instruments mounted onto the medieval book. Fig. 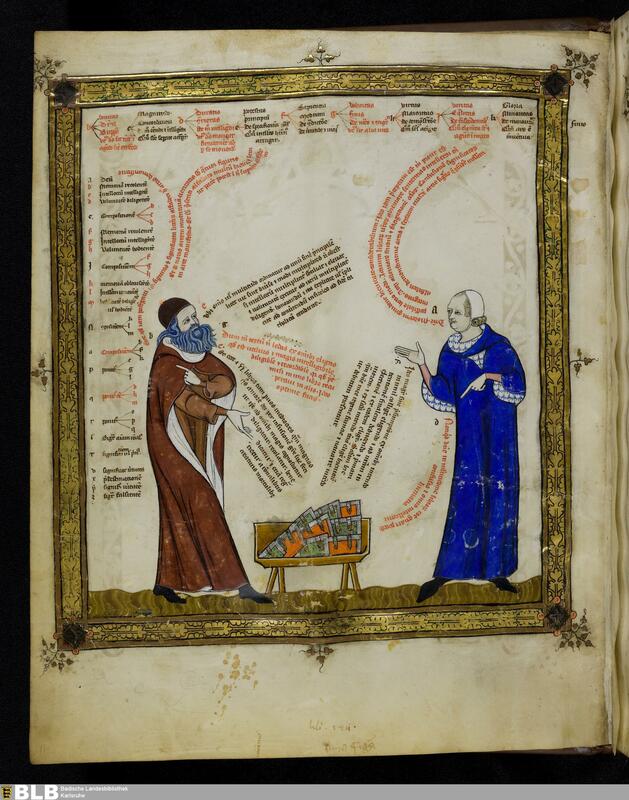 5 shows a page from a manuscript containing various texts about fortune telling. The page holds a text on Geomancy, which is a method of divination that allowed someone to calculate one’s ‘key number’. Random rows of numbers were drawn up and marked down (as seen on the page), after which they were connected by lines. The number you ultimately ended up with was then looked up in a table with lunar and solar information, which was also included in the manuscript (image here). There was another method to calculate this number: by turning a wheel (information here). It is here that the Oxford manuscript becomes relevant for us. Remarkably, the user of the book carved a hollow space into the wooden front board of the binding and fitted a pair of cogwheels into it (Fig. 6). Turning these produced the number that could subsequently be looked up in the table. 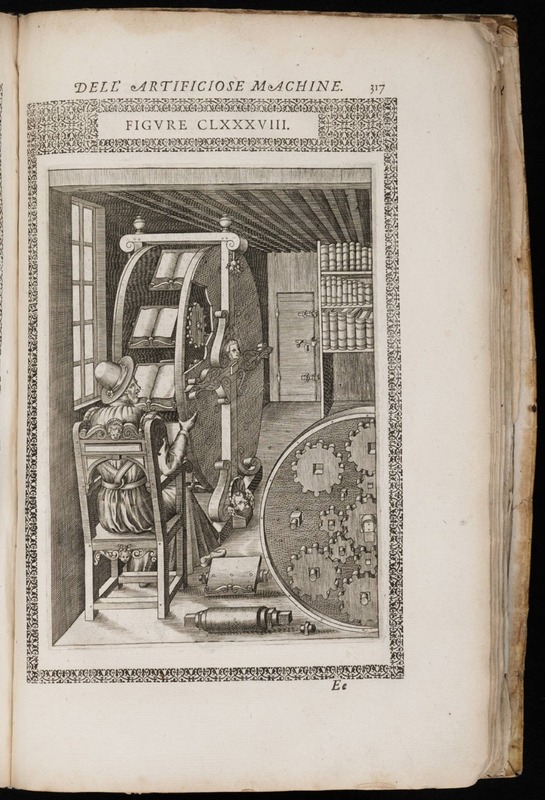 The last example of an instrument that was added to a book also has to do with the sun. Like an iPad, the book in Fig. 7 has a smart cover. 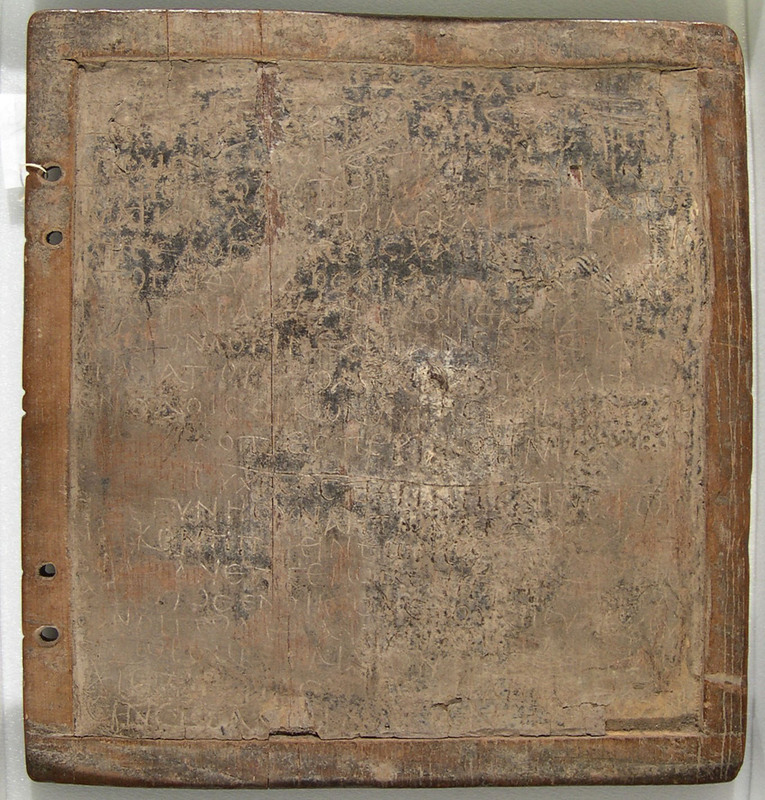 The front of the sheepskin bookbinding is not filled with blind-stamped decoration, as was often the case, but rather a sundial was pasted on it. The reader could put the book in the sun and place a stylus on the cover, which would reveal what time it was. While it may not have been a very practical clock, the cover reveals that it was likely used to this end: the ‘footprints’ of the stylus are still visible (note the small circle and the black stain near the letters IHS, at the bottom). Moreover, the severity of the stain suggests the book was frequently used to tell time. Just like our modern smartphones, the medieval book could be a versatile tool that combined contents with an untold number of applications – giving the scriptorium the feel of an App Store. 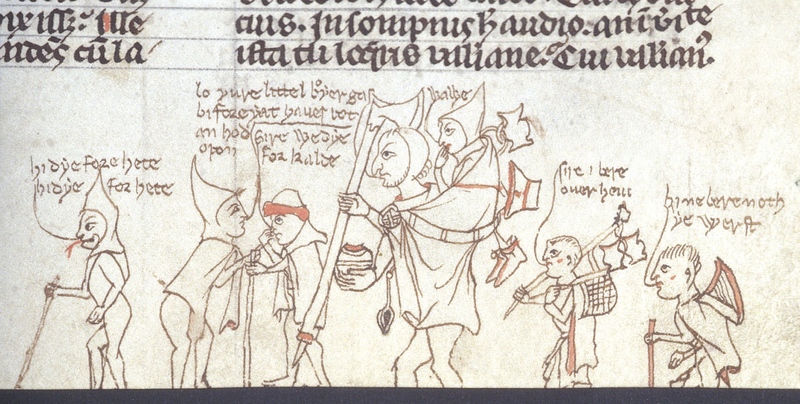 Last week I posted a blog on note-taking in medieval times. It showed how individuals who wanted to jot down a note dealt with the absence of notepads and scrap paper. 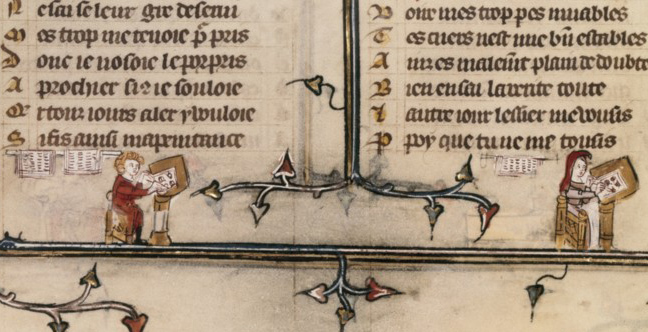 As in our modern day, the urge to write down a note in medieval times often came while reading a book. And so the margins of the page grew into a prime location where the reader could vent his objections or – albeit more rarely – express his or her approval. The present post deals with the logistics behind this “window dressing”: it shows how a reader with many important things to say kept track of his marginal comments. Particularly, it deals with a serious problem that came with adding notes to the page: how to connect a particular comment, placed among a dozen others, to the specific text passage it refers to. The clever system that was created for this purpose lives on as our modern footnote. The crux of our footnote system is the presence of a symbol that connects the note to the relevant location in the text. Curiously, in medieval times it was quite common not to have such connections in place, perhaps especially in the earlier period (Fig. 1). When few remarks were added to the page, a reader could deduce with relative ease to which passage a marginal note referred. 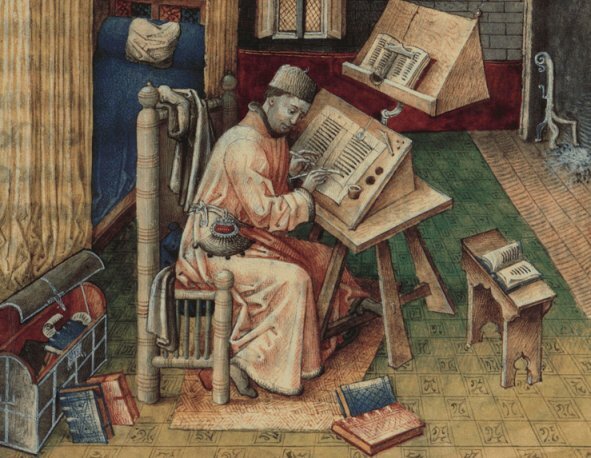 It helped if a text was in popular use or known by heart, as many medieval works were. In such cases the note made sense instantly because the reader was familiar with the referenced literary context. Moreover, as long as notes were few and short, a reader could simply insert them – interlinearly – over the relevant word or passage (Fig. 2). Cleverly, in this system the very position of the remark identified the word to which it referred. However, as the number and size of such comments increased, it became impossible to place them between the lines. The great blank space provided by the margins was now drafted into service. It is here that the absence of a proper reference system was felt. 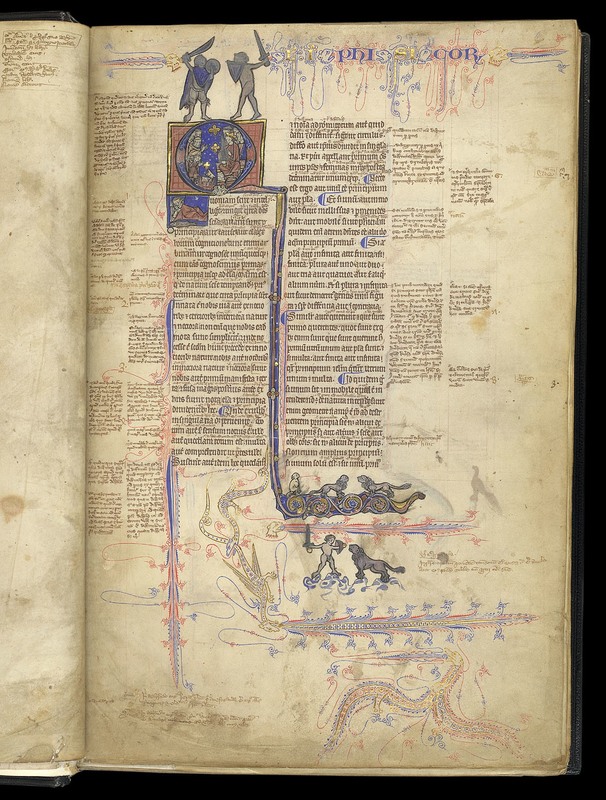 As the marginal body of remarks and critique began to accumulate, the page became a real messy place, a labyrinth in which it became impossible for readers to find specific pieces of information (Fig. 3). In came the footnote. 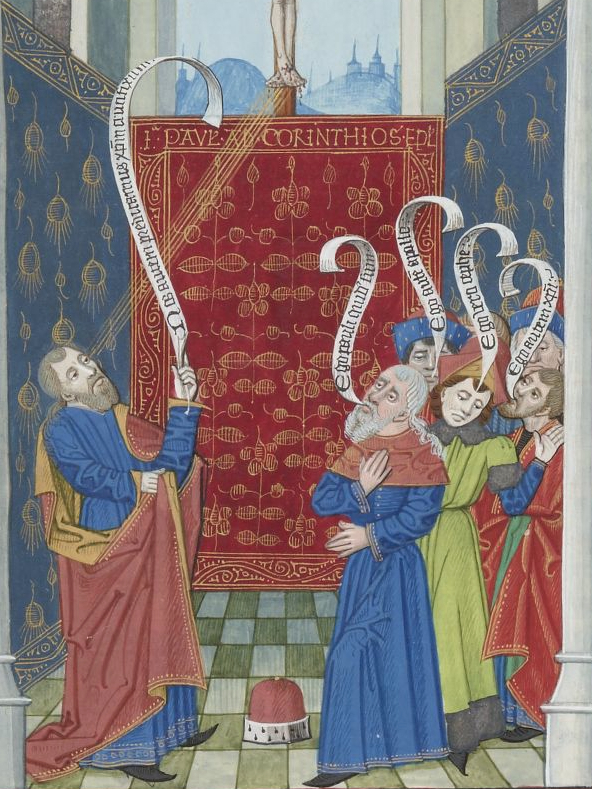 Connecting a marginal remark to the relevant passage in the text was usually done with a duplicated symbol, called a signe de renvoi: one was placed in front of the marginal note, the other near the word or passage that the remark commented upon. While it is hard to deduce a clear pattern of development, it appears that in the early stages of using such footnotes scribes and readers resorted to plain symbols rather than letters or numbers. These symbols varied considerably in shape and sophistication. At the high end of the spectrum we encounter complex symbols, such as the reversed letter E seen in Fig. 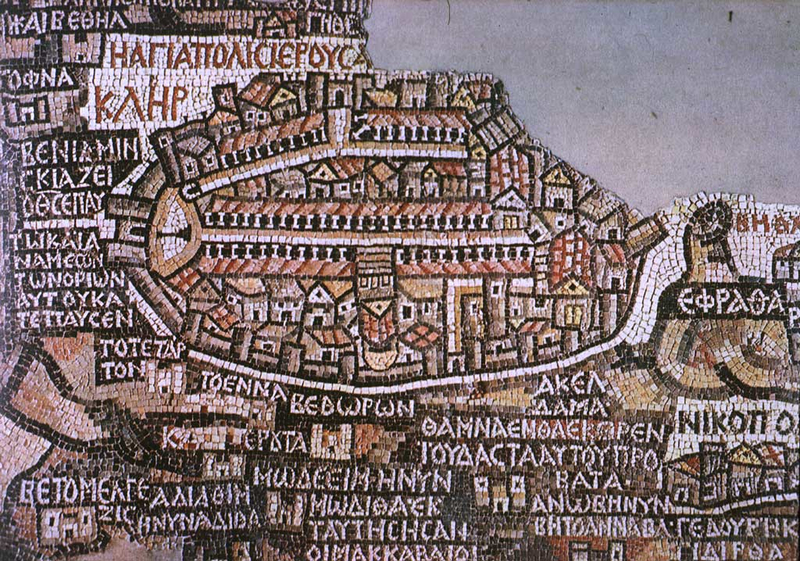 4 (magnified). More popular, however, were less complex symbols, which could be added to the page much quicker. Dots and lines are particularly common ingredients of such footnote symbols. Interestingly, their first appearance (it seems to me) is not as a connector of comment and text, but as an insertion mark that added an omitted line into the text. In Fig. 5 such an omitted line is placed in the margin accompanied by a symbol made up of a line and a dot. It is repeated in the text itself, near the location where the line belonged. This omission mark may well be the origins of the footnote system that would emerge over the course of the Middle Ages – and that we still use today, almost unchanged. Scribes used different versions of the line-and-dot symbol. In fact, they had to if they were to produce unique ties between comment and text. 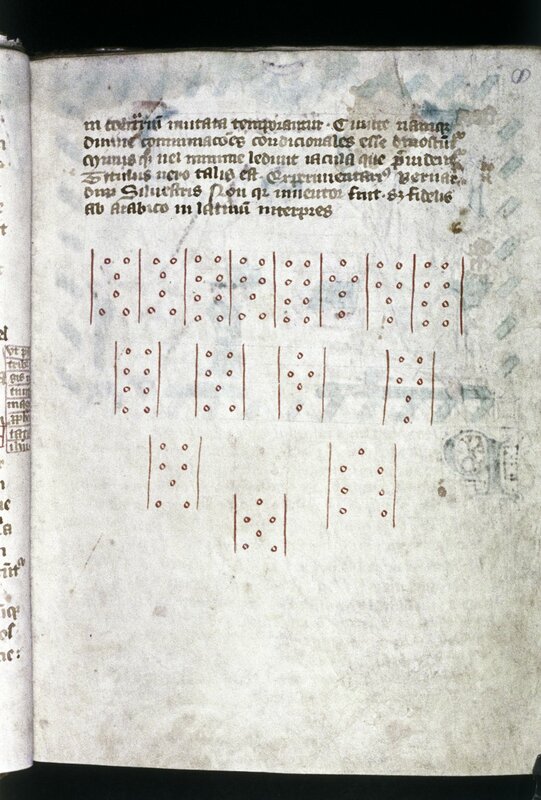 When dots were used, their number would increase as more notes were added. Alternatively, the position of the dots could be varied, so that they formed different – unique! – patterns. 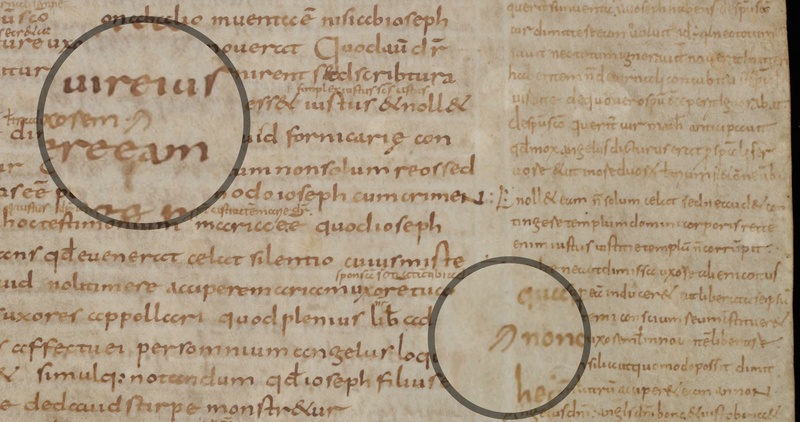 Customising the line-type footnote, scribes usually distinguished one from the other by added circles, which were attached at different locations and in varying numbers. 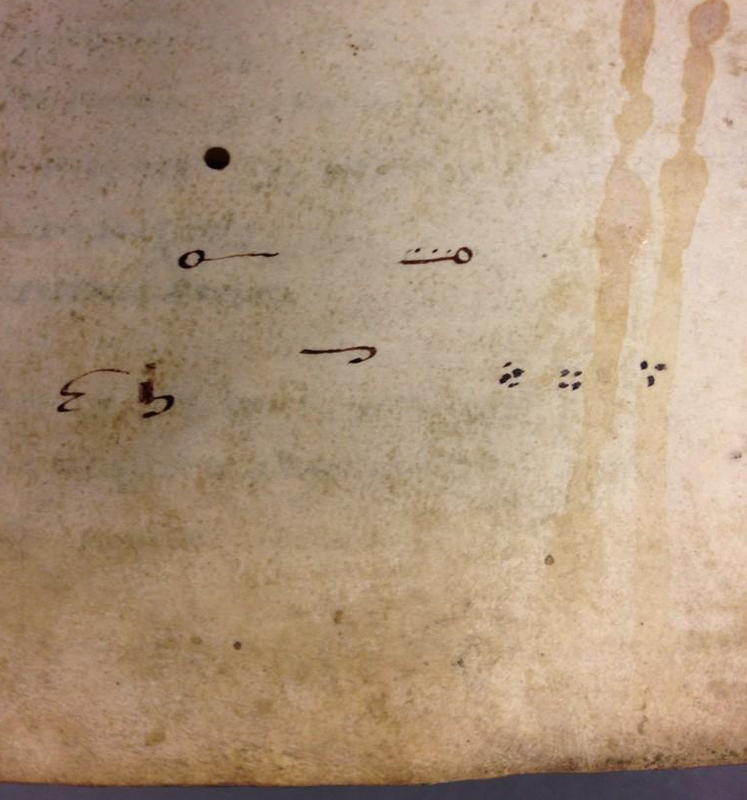 In what is a most unusual find, in a Leiden manuscript we see a scribe practicing his dot and line footnote symbols (Fig. 6). It shows variations in the number and pattern of dots, as well as in the treatments of lines. Closest to our modern system of footnotes, finally, is the use of letters to tie a marginal remark to its proper location in the text. 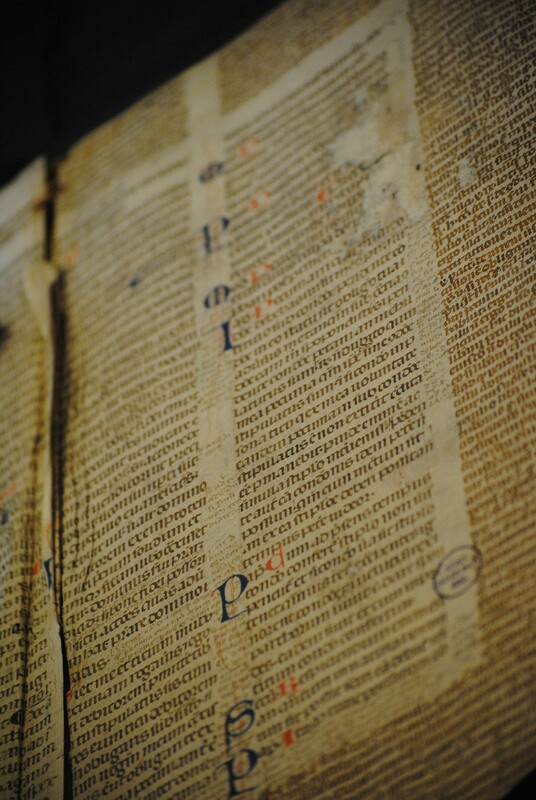 In some manuscripts we see the entire alphabet running down the margin. Fig. 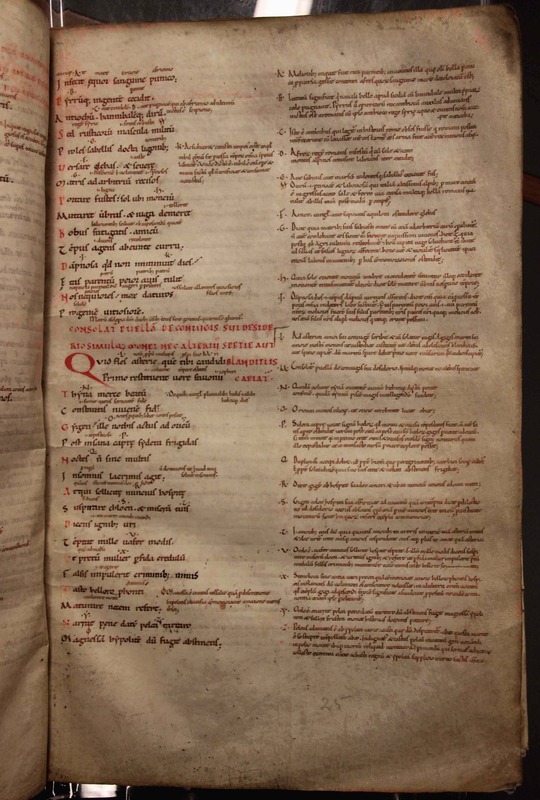 7 shows a page from a manuscript with works by Horace (left column) to which a high volume of notes were added (right column), all of which are connected to specific passages with the letters A to Z. In the eleventh and twelfth centuries such classical texts were most commonly used in a classroom setting. The instructors who used the books, typically in a monastic school, had many things to explain to their students, as the notes show. It made sense to organise such added information in a clear manner, and the alphabet came in handy in this respect. Some pages in this particular book contain more footnotes than there are letters in the alphabet, which challenged the system. In such cases the user added into the mix symbols made from lines and dots. 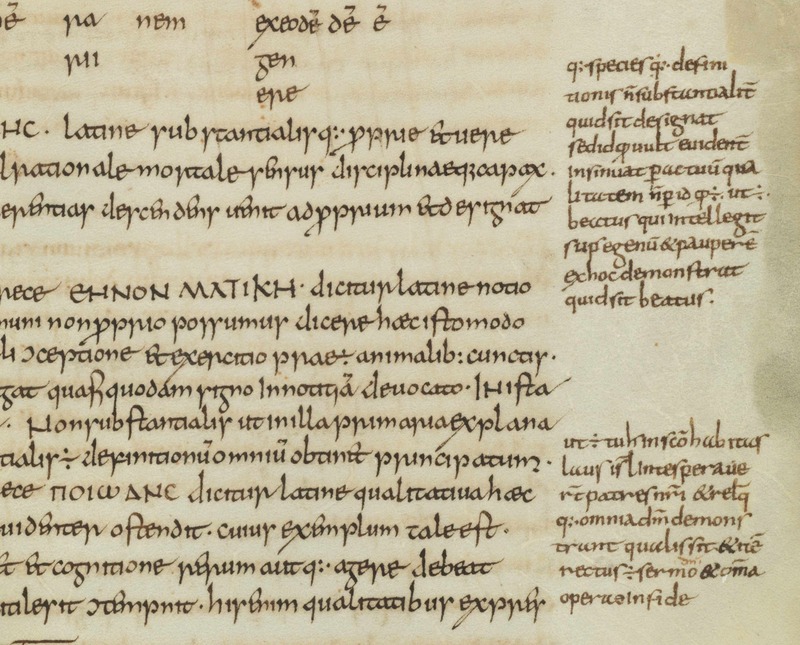 So where are the medieval footnotes that make use of numbers, like we do today? Curiously, I have not been able to find them, which kind of makes sense. Roman numerals would not be suitable for the task. 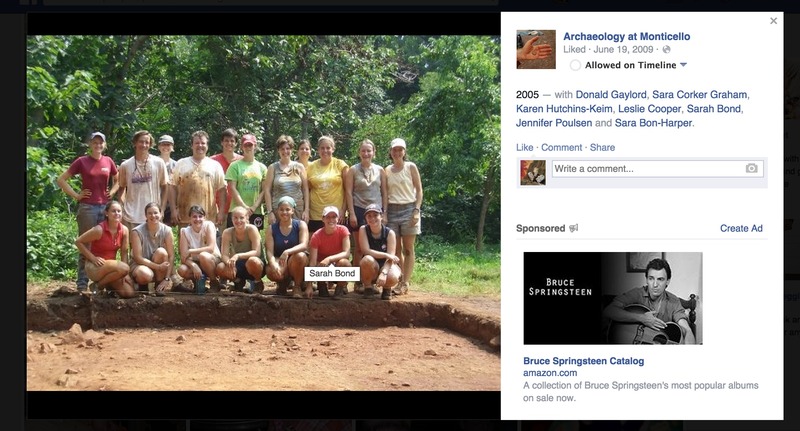 Placed out of context, as a symbol initiating a segment of text (i.e. the marginal comment) they would easily be mistaken for a letter – which they are, graphically speaking. Moreover, a high Roman numeral would quickly take in a lot of space – not what you want in a note symbol. Arabic numerals were far were less popular than Roman numerals, even in the later Middle Ages. Readers may not have felt comfortable enough with these new numbers to use them in the margin. 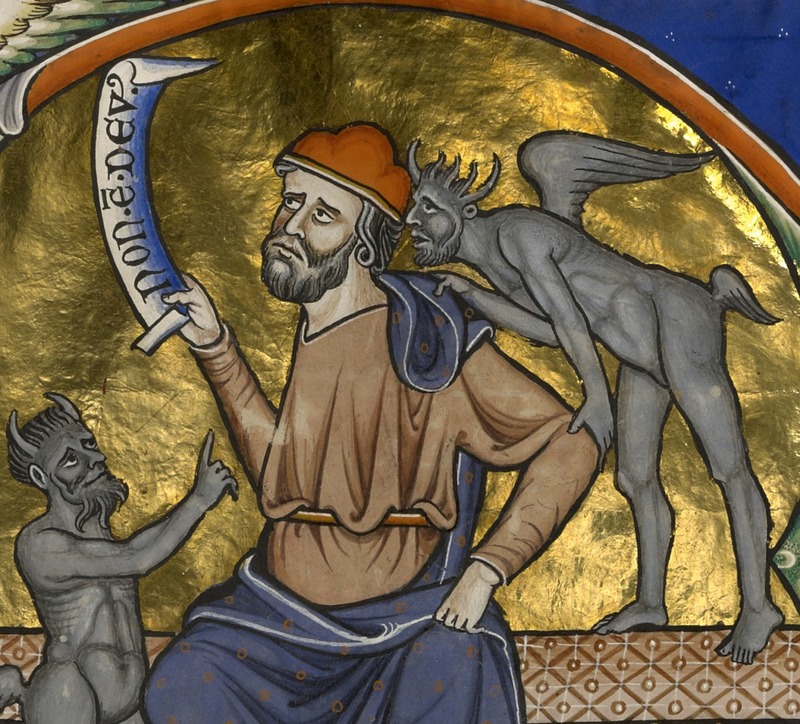 In fact, some scribes in the later Middle Ages are still confused by the zero. The leap from alphabet to numerals – from the medieval to our modern system – appears to have been taken in the age of print. As far as producers of books is concerned, there were only two kinds of artisans who handled a tool with which a selfie could potentially be produced, if the individual was so inclined. 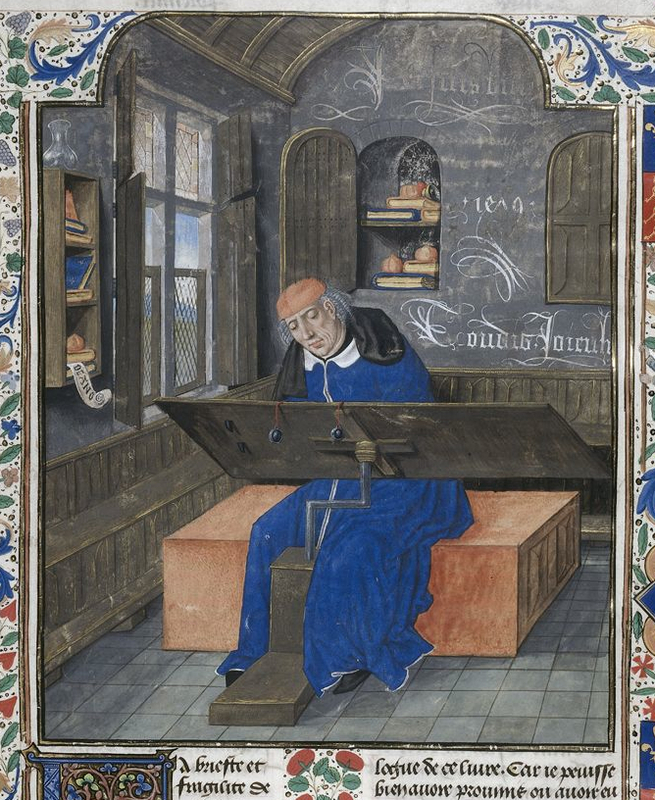 Scribes could doodle themselves using ink and pen; and decorators could do the same with brush and paint. In practice, however, we almost exclusively encounter self-portraits made by decorators, perhaps because scribes lacked the skills and equipment to produce something meaningful. Even so, decorators rarely put themselves in the picture. The exceptions to this rule are real treats, as this post aims to show: they provide sneak peeks into the workshops of medieval artists. When a decorator is seen on the page, we must assume that a conscious choice was made to become part of the book’s decoration program. 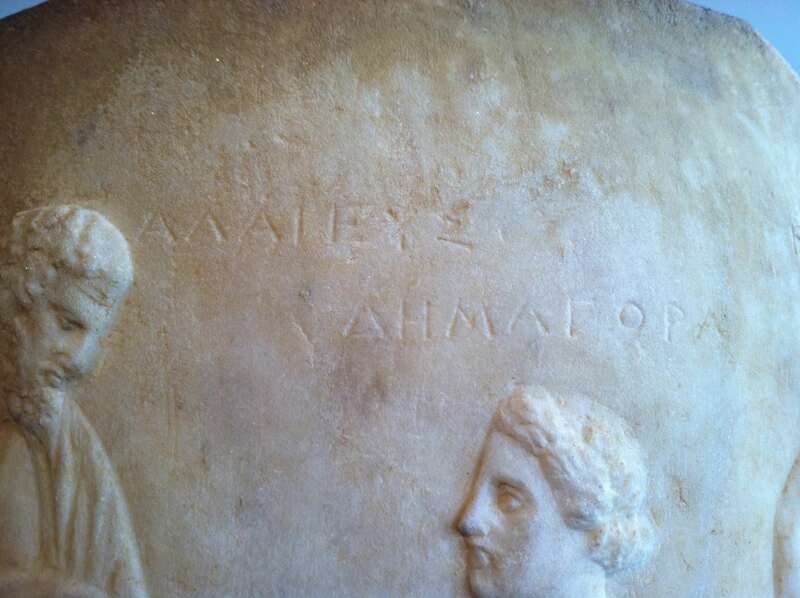 This is particularly evident when the decorator added his or her name and designation (“decorator”). 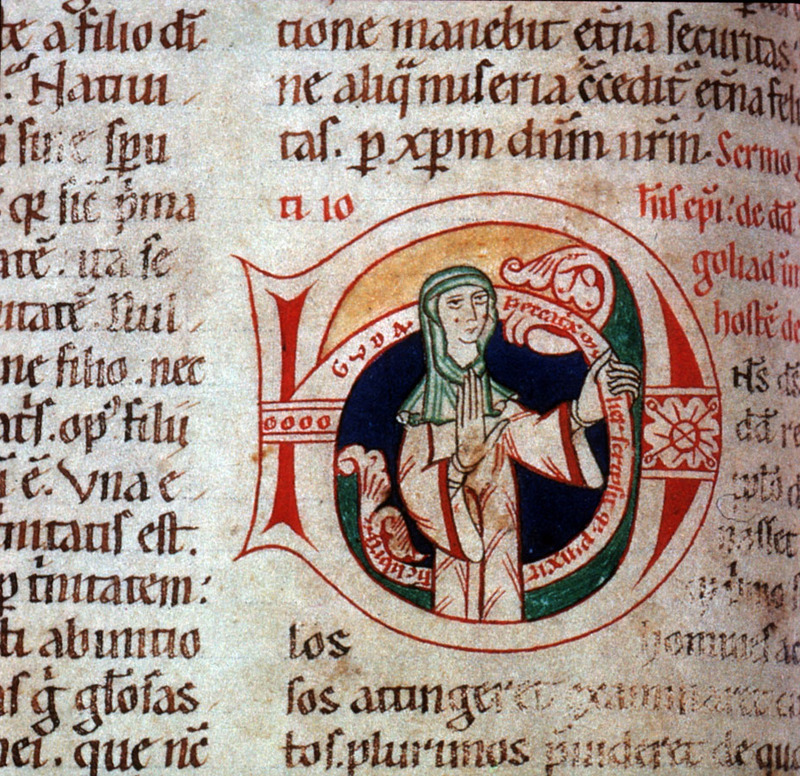 This is precisely what the nun Guda did: she depicted herself inside an initial letter D with a banderole (title banner) that reads “Guda, sinner, copied and decorated this book” (Fig. 2). It seems out of sync with the modest life style of nuns to identify oneself with name and title. Pride was a vice so there must have been another reason behind Guda’s self-identification. Perhaps she did so with a sense of history: she is raising her right hand as if to greet future readers. In spite of this very expressive scene, Guda’s selfie does not give away too much about the medieval artist’s workshop. In fact, if it wasn’t for the words on the banner, we would not have guessed that she was a decorator. Where are the paraphernalia of the trade? 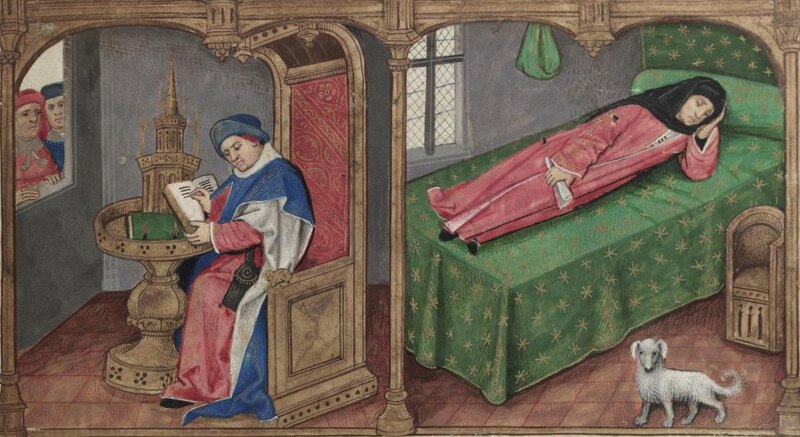 Fortunately, there is another example that provides more detail about the working environment of monastic artists (Fig. 3). This image was produced by Rufillus, monk in Weissenau Abbey in Ravensburg, Germany, near the end of the 12th century. 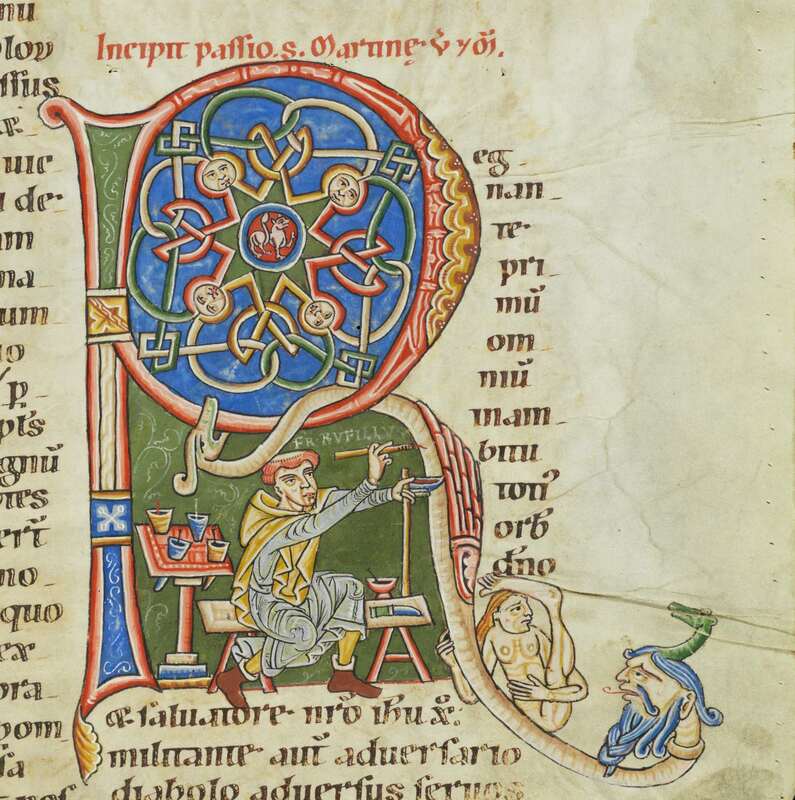 In the selfie we catch Rufillus putting the finishing touches on a giant letter R. He wrote his name above his tool: there is no avoiding that we get to know him. 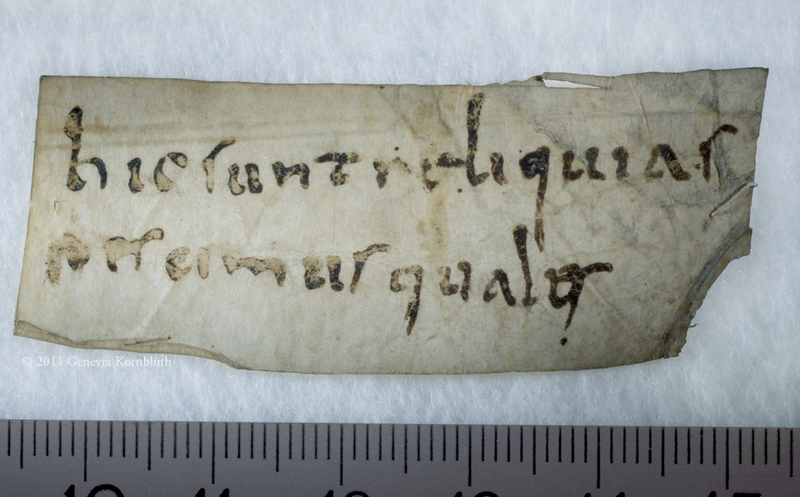 Remarkably, in another manuscript we encounter Rufillus again. 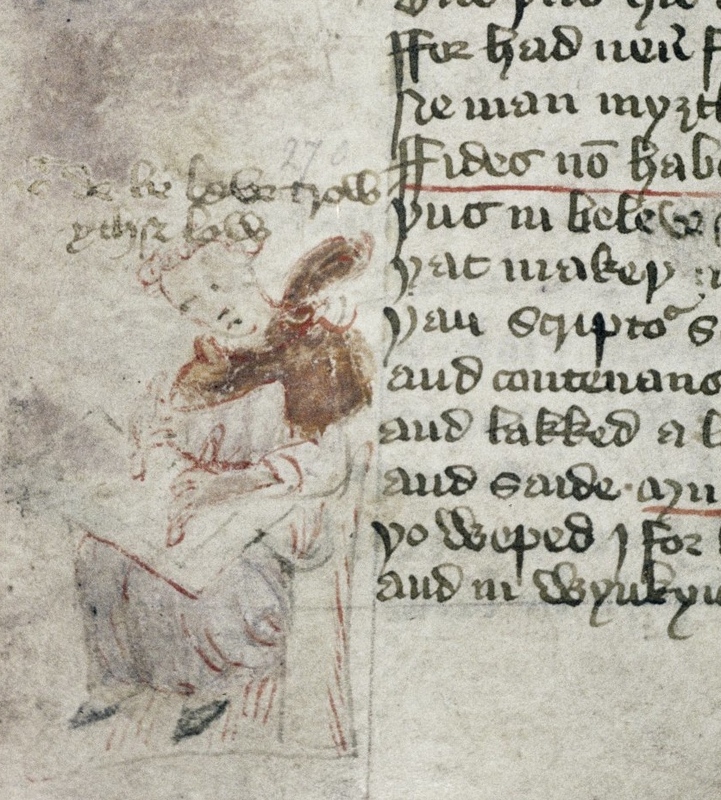 This time he depicts himself as the scribe of the book – he scribbled, oh vanity, his name above himself (Fig. 4). Rufillus the decorator places himself in a rich setting: in Fig. 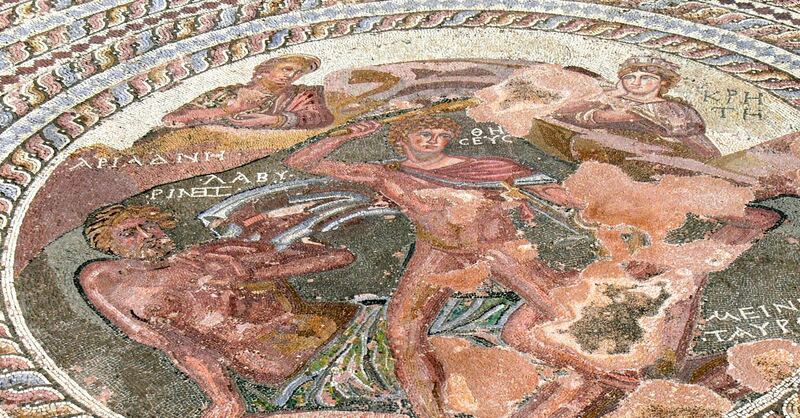 3 we see him surrounded by pots of pigment and various instruments. 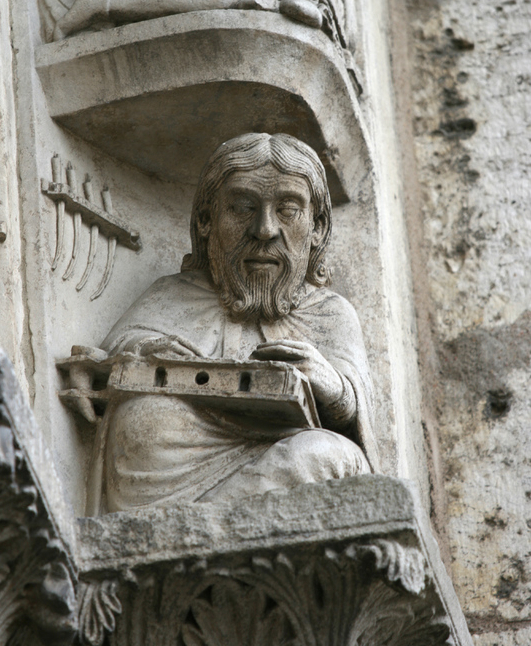 He provides us, in other words, with a much wanted glimpse into his monastic workshop. 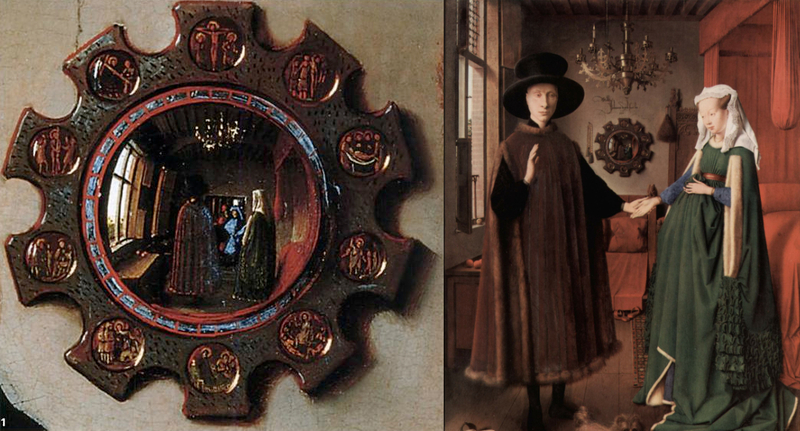 Moreover, like the nun Guda, Rufillus was apparently active as a decorator and a scribe, which is another important detail that can be derived from the selfie. What is most striking in light of this post, however, is the similarity of the two portraits: in both, Rufillus shows himself as having bright red hair, big eyes and pronounced wrinkles on his cheeks. The similarity strongly suggests that this is what our decorator really looked like, which is a fascinating thought. 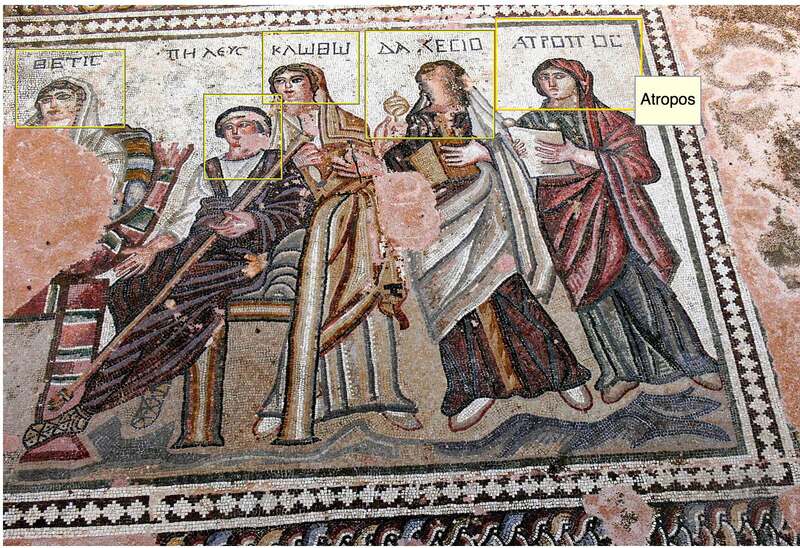 Such detail-rich selfies are also encountered in books that were made commercially. 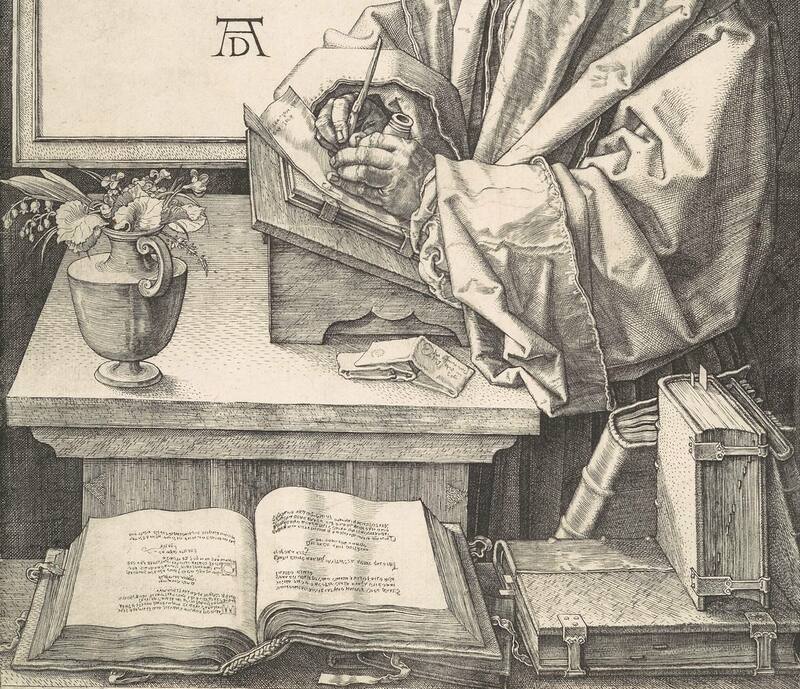 A particularly telling self-portrait was made in 1512 by the German book decorator Nicolaus Bertschy (Fig. 5, more information here). In this portrait, which is included in the Lorcher Graduale, he shows himself in the company of his wife, who appears to be drinking from a large mug with her arm around his neck. It is not the scenario you would expect, this rather down to earth setting where drinks and female distraction replace both decorum and concentration. Nicolaus introduces himself in a note beneath the image: in spite of the scene, he clearly saw no need to hide his identity. Next to him we see the scribe Leonhard Wagner (note the “LW” on the white shield), who is said to have known a hundred different kinds of handwriting (more here). 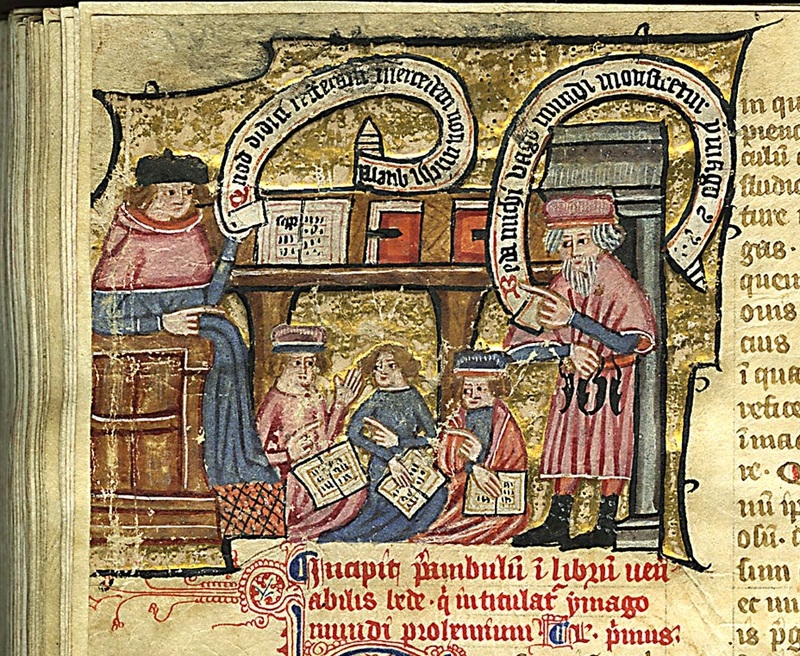 The illustration shows the two artisans producing the very choirbook in which it appears, making this a selfie with a fascinating double layer. 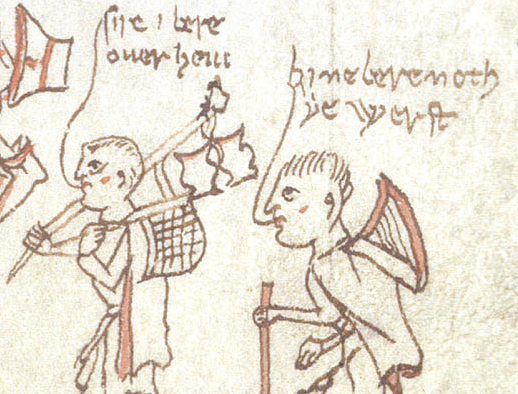 Remarkably, a manuscript from fourteenth-century Paris also presents a selfie of a decorator and his wife (Fig. 6). 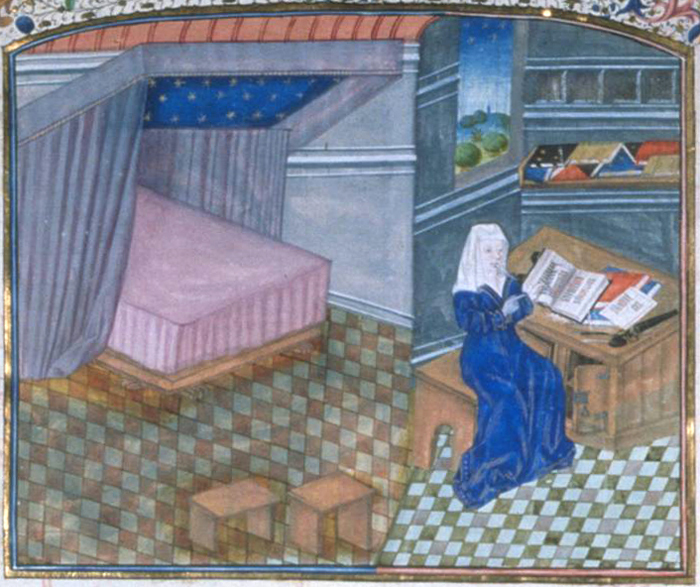 It shows Richard and Jeanne de Montbaston, who worked in the second quarter of the century. 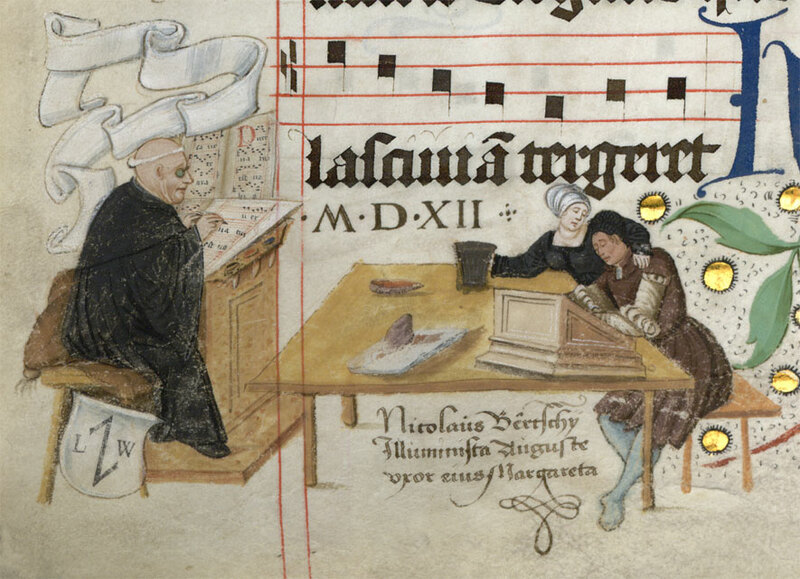 In this great image Richard appears to copy the text while Jeanne is busy decorating the pages. Given this division of labour it was likely Jeanne who produced this selfie. There are many more details that prove insightful for artists’ workshops. Parchment sheets that were finished are hanging to dry on clothes lines, for example. Interestingly, in a commercial setting such selfies can be regarded a kind of advertisement, especially when a name was added. 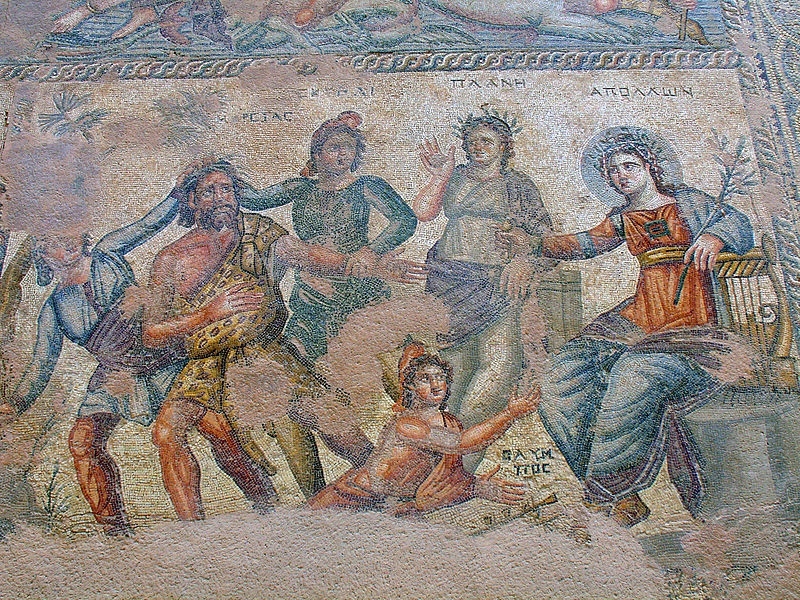 It identified, after all, who had produced the decoration – as if to say, “If you like this, you know who to contact!” It is somewhat perplexing, however, that patrons allowed artists to add put such spam in their newly purchased books – especially when showing a decorator and his wife drinking on the job. 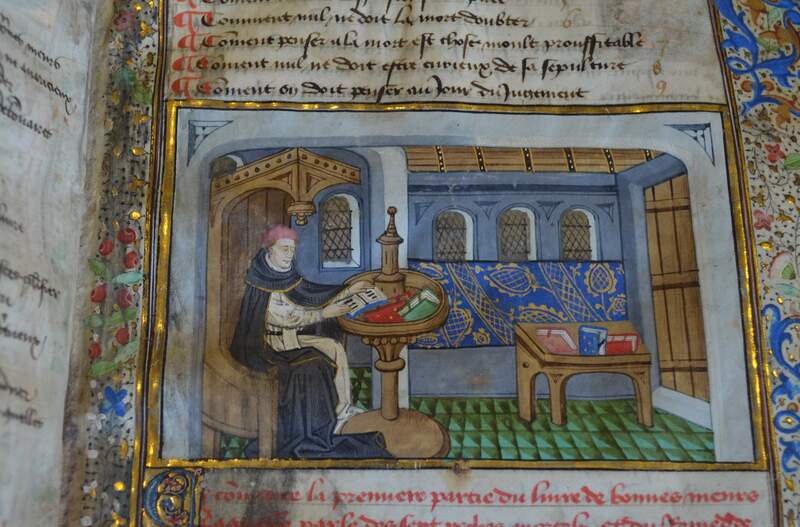 And what about selfies of scribes? Here things are less clear. Occasionally we encounter a plain pen drawing of an individual copying. 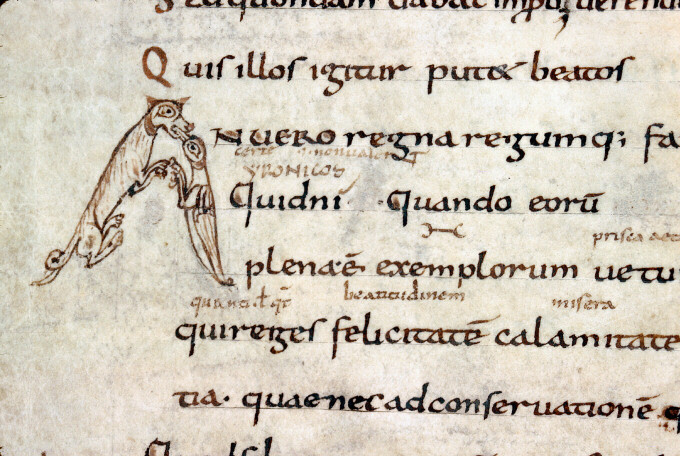 However, they are (to my knowledge) never accompanied by name and designation (“scriptor”), meaning we cannot know for sure if the scribe meant to show himself or simply drew a generic “scribe”. The drawing in Fig. 7 is an example of such unclarity: it may be a selfie, or it may not be. 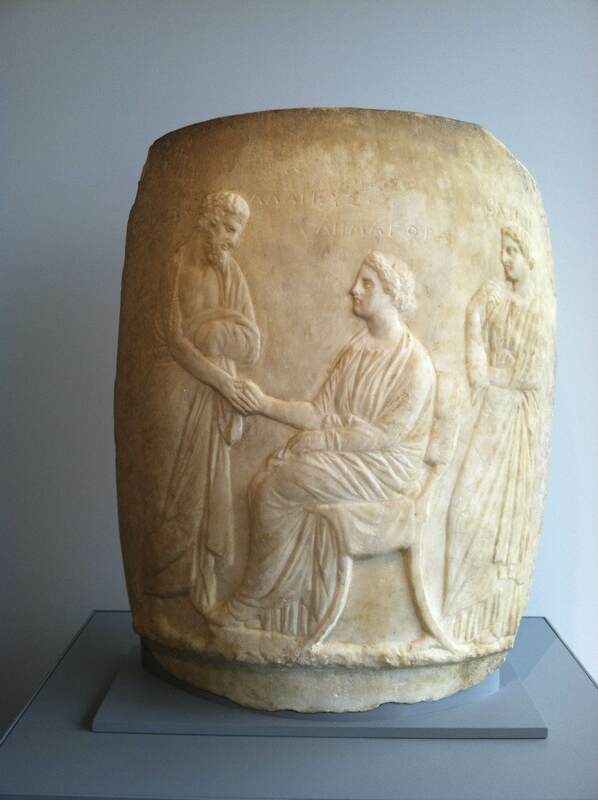 Studies have shown that the writing figure is a clerk, a copyist affiliated to an institution where documents were made. As it turns out, this particular manuscript containing the text Piers Plowman was produced by a clerk. This is evident, among other things, from the way in which the dated colophon in the back of the manuscript was worded. Moreover, the marginal notation above the clerk’s head, which appears to be in the same hand as the main text, writes over the top of the drawing. 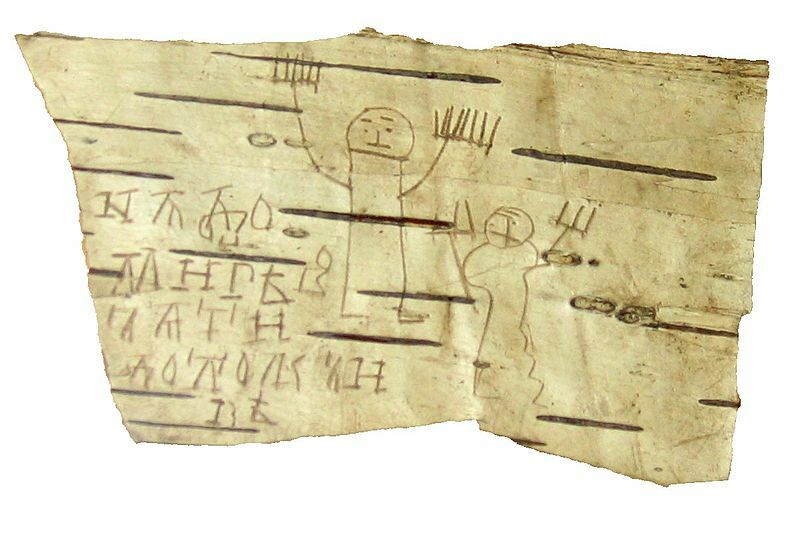 This suggests it was the scribe himself who drew it. 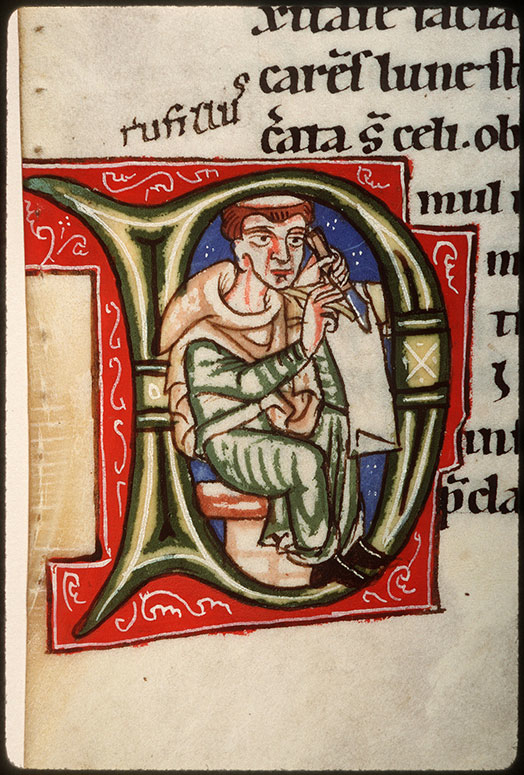 A writing clerk drawing a writing clerk: is it enough to call this image a selfie? It’s a great conundrum that shows the limits of taking the modern notion of “selfie” to an age when cameras didn’t exist.